Some people may not realize the many ways a Major Arcana only tarot deck like the Majors edition of Tabula Mundi can be useful. Of course, one can always take the time to separate out the Majors from any tarot deck. But you might wonder why you would want to do that. 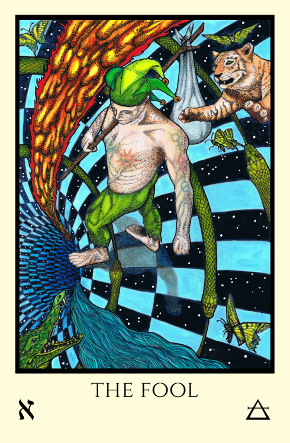 It is said that The Fool carries the entire Universe of the Tarot in his pack. One use is for pathworking, an occult practice of many of the Western Mystery Traditions such as the Golden Dawn. It can be described as the process of taking an inner journey to clairvoyantly or astrally explore each of the 22 paths of the Qabalistic Tree of Life in order to experience the landscape and symbolism. It is similar to CG Jung’s Active Imagination. You put yourself “in” the symbol and experience the archetype directly. I hope to write more about this in a future post. The book by Dion Fortune called Mystical Qabalah is a respected source for deeper info. 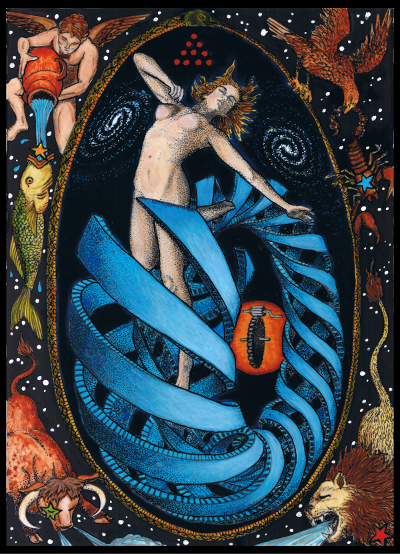 The Tabula Mundi tarot card set, with their large format size and each card having the appropriate Hebrew letter of the path and the alchemical or astrological symbols, especially is designed for this. The wooden box for the deluxe set has a built in card stand where you can put your focus card, and below it, the tree of life diagram with the labeled paths that comes with the black and white tarot edition. For a limited time with the Deluxe boxed edition I’ll also include a “card” made of heavy duty rewriteable transparency film, that you can lay over the tree of life card and mark your path of focus in an appropriate color to facilitate this process or to just lay out with your “card of the day” as you learn the paths. It is a good visual method of learning. 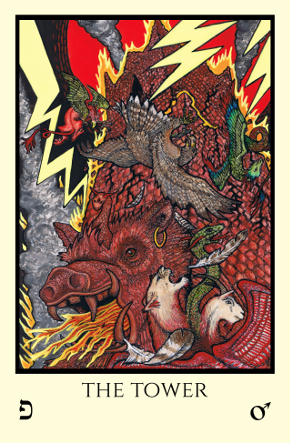 Speaking of “card of the day”, that is another good use of a Majors only tarot deck. Displaying your card on an altar (or on the card stand built into the Tabula Mundi wooden box) in the morning and then reflecting during the day or in the evening on how the archetype manifested can be a profound practice. Another use is for meditation. Eyes open meditation on a symbolic object both frees and directs the mind simultaneously. At least it does for me, your mileage may vary. One can use a Major Arcana tarot deck for divination as well. This is actually the preferred way for some, more commonly in European traditions. While Majors decks can be used at any time in any spread, many say that they prefer spreads with fewer cards for this, and that the readings are more suitable for big picture or more weighty rather than mundane concerns. Dan Pelletier, one of the owners of The Tarot Garden, came up with a two-card spread called Windows and Doors that I think would be great with just Majors only decks. Basically, the first card is the “window” or what the universe wants you to see or has on offer, and the “door” is what you need to do to get it. An additional layer one could add to a two card Majors only spread, would be to combine those two cards to see if you obtain a “hidden” pip or small card. Each of the 36 tarot small cards is associated with a decan of the zodiac. Each of the twelve signs is divided into ten degrees, each of which is ruled by a certain planet, starting with Mars in Aries (the first decan of Aries) and following what is called the Chaldean order of the planets (Saturn, Jupiter, Mars, Sun, Venus, Mercury, Moon). The Sun is positioned in the center, the outer planets on the left and inner on the right (vice versa, depending on your perspective), reflecting the perception of speed of the planet’s motion as seen from Earth. So the thirty degrees or three decans of Aries are ruled in order by Mars (0-10 degrees), Sun (11-20 degrees), and Venus (21-30 degrees). These decans are associated with the Two of Wands (Lord of Dominion), the Three of Wands (Lord of Established Strength, or Virtue), and the Four of Wands (Lord of Perfected Work, or Completion). So using this method if you got a combination that resulted in having a planetary trump and a zodiacal trump in a two card reading that equals any of the 36 pips, you could get a third “hidden” message, that of the associated small card. 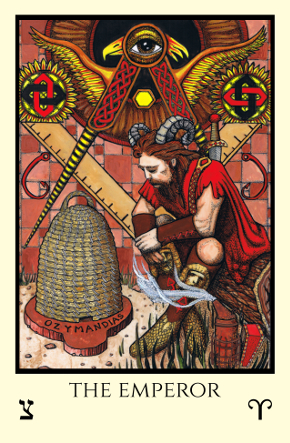 If you got The Tower (Mars) and The Emperor (Aries), your small card would be the Two of Wands, Lord of Dominion. The Emperor + The Tower = The Lord of Dominion (Two of Wands) Mars + Aries First decan of Aries ruled by Mars. So these are just some of the ways you may want to use your Majors only decks. I hope to write more detailed posts on each of them in the future; this is just a spur-of-the-moment overview since someone asked. If you have other uses, please post them in the comments section.